DOHA // Qatar’s Hassad Food knows how to shop. To help ensure a steady supply of food for the nation’s fast-growing population, the $1 billion (Dh3.7bn) subsidiary of Qatar’s sovereign wealth fund finalised a $500 million agreement last year to grow wheat and rice on 100,000 hectares in Sudan and has announced plans to invest up to $700m worldwide this year. It is finalising the purchase of a sugar plant in Brazil capable of providing all of the emirate’s raw and refined sugar and acquiring a Brazilian poultry farm that would provide 60 per cent of its poultry and eggs. These deals come after major grain and livestock investments in Argentina and Australia. Yet Qatar’s worldwide drive for food security, in which Hassad Food is playing a key role, faces obstacles, not least of which are the vagaries of distance and political change. “There’s the problem of transport, as well as possible disasters and social and political disruption,” said Mahendra Shah, the director of the Qatar National Food Security Program. Established by the government in the wake of skyrocketing food prices in 2008, the food security programme sets Qatar’s policy strategy for securing food supplies. It aims to improve self-sufficiency and import efficiency, but has come up against natural, logistical and political hurdles. Farming in the Gulf region is a challenge due to minimal water, extreme heat and poor soil. Qatar, with a population of 1.7 million, imports as much as 90 per cent of its food, including nearly all its rice and grains. Yet Qatar’s food security programme is working on a comprehensive agricultural production plan, looking into the use of greenhouses, drip irrigation, and solar-energy desalination to improve fruit and vegetable production. The plan should be completed in mid-2012. For commodities Qatar cannot produce, Hassad Food looks to build partnerships with foreign suppliers. Last year it finalised a $500 million agreement to grow wheat and rice on 100,000 hectares in Sudan and has announced plans to invest up to $700m this year. GCC spending on food imports is forecast to more than double to $49bn from $24bn by 2020, according to a 2009 report by the Economist Intelligence Unit. The UAE has spent $100m for 400,000 hectares of farmland in Sudan while Saudi Arabia’s King Abdullah Initiative for Agricultural Investment Abroad has launched a plan to build a series of farms across eastern Africa. Critics have denounced international agro-investments by wealthy countries as “land grabs” and “neo-colonial”. A World Bank report leaked to the Financial Times last month may shift the public position of the international financier, which had long argued that such investments could be advantageous for both sides. The leaked draft states that wealthy agro-investors are “failing to deliver on promises of jobs and investments” and inflicting serious damage on local resources. Some observers doubt that Qatar’s embrace of partnerships, rather than purchases, represents a new paradigm. “While it is necessary for countries such as Qatar to enter international agreements to ensure their food security, it is essential that such agreements are not detrimental to local populations,” Anuradha Mittal, the director of the Oakland Institute, a US think-tank, said. She noted that Brazil has inequitable land distribution, with 10 per cent of farmers holding 85 per cent of the land, and that Qatar’s deals with major farmers may further consolidate farmland. 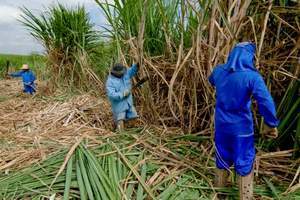 In addition, most workers in the sugar industry are migrants who work only during harvest time, suffer long hours and receive inadequate wages. “If such demands from the grassroots movements are not met and international agreements fail to ensure that benefits also accrue to the local poor and improve working conditions, such deals, even if they are partnerships with wealthier countries, would amount to land grabs,” said Ms Mittal. Ensuring a reliable, long-term food supply from distant lands faces other hurdles. A recent study by the World Food Programme on cross-border trade in West Africa found that economic and political shocks undermined that region’s ability to support food security. “Preferred bilateral access to production only works during good times,” said Mr Woertz, citing Russia’s current ban on wheat exports as a result of heat and drought. “Diversity of supplies and open international markets are therefore of the essence.” The risks of Australia, Brazil or Argentina are minimal compared to those of Sudan or Ethiopia. Still, to avoid the fiscal pain of inflation or disruptions in the food supply, Mr Woertz advised GCC countries to establish an internationally co-ordinated system of strategic food storage, perhaps with the help of the World Trade Organisation and other international organisations.